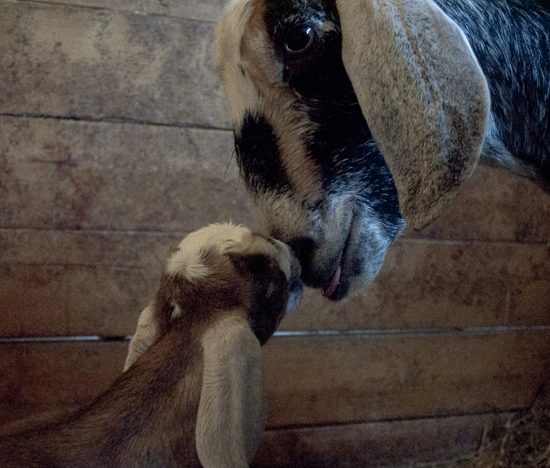 Demand for goat’s milk is growing nationwide, fueled in part by the belief that it’s a healthier and more ethical alternative to factory-farmed cow’s milk. But beneath the image of happy goats frolicking on family farms is the hard truth that cruelty is embedded in the product. Animals produce milk for one purpose only: to feed their offspring. To get their milk, farmers have their goats impregnated. After five months gestation, the kids are born, then separated from their mothers. The female kids may be kept as future milk producers, but male babies are useless on a dairy farm. They’re typically slaughtered right away to spare the expense of raising them, or they’re fattened for meat. The males who will be raised for meat undergo another painful process—castration. A tight rubber ring is fitted around the base of the testicles, cutting off their blood supply. Over time, the testes shrivel up and die. When the goats reach 25-35 pounds, they’re auctioned off or sold privately. Eventual slaughter may await female goats, too. Once their milk supply drops off, they have outlived their usefulness and are often sold for meat. Certainly, there are many dairy goat farmers who raise their animals with care and kindness. Cheri and Jim were among them at one time. But in the end, there were the kids—too expensive to keep and coveted for their meat in some communities. Cheri and Jim would watch, heartbroken as the kids were hog-tied and thrown into the trunks of cars or the backs of trucks and carted off to slaughter. The sounds of the goats’ muffled but terrified cries as they were driven away etched a deep line for the couple between humane and inhumane farming. They knew on which side they belonged. Below: Cheri made the compassionate decision to save goats by turning her farm into a sanctuary for rescued goats (and many other animals) in 1997.